Abstract. 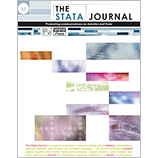 We present a new Stata command, bmte (bias-minimizing treatment effects), that implements two new estimators proposed in Millimet and Tchernis (2013, Journal of Applied Econometrics 28: 982–1017) and designed to estimate the effect of treatment when selection on unobserved variables exists and appropriate exclusion restrictions are unavailable. In addition, the bmteAnnals of Economic and Social Measurement 5: 475–492; 1979, Econometrica 47: 153–161); 2) a control function approach outlined in Heckman, LaLonde, and Smith (1999, Handbook of Labor Economics 3: 1865–2097) and Navarro (2008, The New Palgrave Dictionary of Economics [Palgrave Macmillan]); and 3) a more recent estimator proposed by Klein and Vella (2009, Journal of Applied Econometrics 24: 735–762) that exploits heteroskedasticity for identification. By implementing two new estimators alongside preexisting estimators, the bmte command provides a picture of the average causal effects of the treatment across a variety of assumptions. We present an example application of the command following Millimet and Tchernis (2013, Journal of Applied Econometrics 28: 982–1017).